This low fat, low calorie dish is not only quick to make but is very high in vitamins. Shrimp is low in saturated fat and is a great alternative to meat proteins. Together, they make the perfect combination for a nutrient-dense dish that takes less than 25 minutes to make! 1. Wash, clean and devein the shrimp if you are using fresh shrimp. If using frozen, you just need to soak them in lukewarm water for about 15 mins. 2. Wash and drain the spinach. 4. In a pan, heat up about 1 and 1/2 tablespoons of oil. Add the garlic and fry until they almost turn brown. Be careful not to burn them. 5. Add the diced onion and fry until they turn brown. 6. Add all spices as above including the salt and fry for 1 minute. Add 1/2 cup water to make a paste. 7. Add the shrimp and allow the massala to blend into the shrimp. Cook for 4-5 minutes until shrimp is pretty much cooked. 8. Stir in the spinach and allow to cook. Let simmer on medium/high heat for 10 minutes. Ensure the sauce has dried up before removing from heat. Recommendations: Serve with hot rice of your choice or any bread of your choice such as roti, chapatti, or naan bread. Also goes really well with wholewheat pita bread! Really happy to hear my recipe was like your mum’s! Keep reading! Tried this for dinner this evening but I was a bit apprehensive about using a frozen packet of spinach, instead of fresh leaves but even then it was so delicious, tasted just like my mothers cooking. Thank-you for sharing. Hi. This was a hit with hubby, thank you. Would like to know what quantities you mean by ‘bag of shrimp’ and ‘bag of spinach’ ? Seemed like I may have had the proportion wrong. 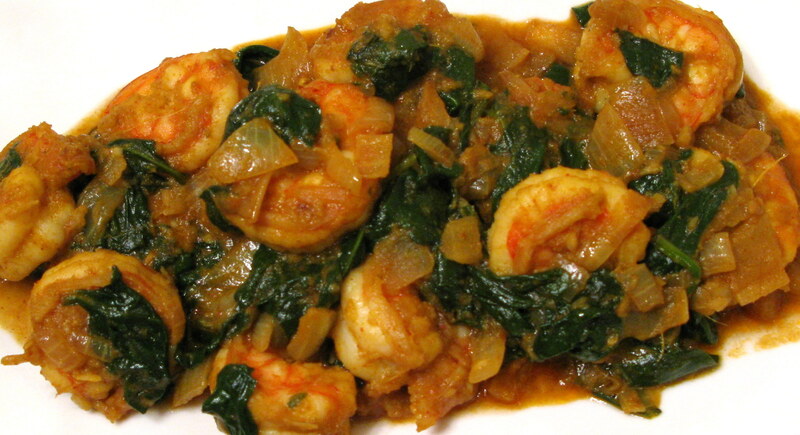 When it is finished what should the ratio of spinach to shrimp be? Thanks again. was more like a flavourless soup than a curry 1/2 cup of water was far too much and their was far too little spices. I followed the recipe word for word and it was awful. ended up having cereal for dinner. Loved it! Added some tasty tomatoes as that’s my thing! Quick & tasty, ready in the time it took to cook the rice! Better than a Friday night takeaway! !